Tropical Fruit Smoothie, equal portions of pineapple, mango, banana, and peach. This is one of those recipes that are just too easy not to share. I know it is getting cooler for most of us in the Northern Hemisphere, and a cool refreshing smoothie might not fit with many Halloween or holiday menus in the near future, but hey, it’s in the mid-eighties here right now and we broke a temperature record high at RDU airport yesterday. And for all my friends in Australia and New Zealand, this is perfect timing right! Smoothies can be enjoyed for breakfast, lunch, or dinner, and are so quick and easy with a good blender, you can have a tall glass ready in just minutes. Endless variations include the Tropical Fruit Smoothie* consisting of equal portions of pineapple, mango, banana, and peach. Or how about fruit selections such as raspberry, blueberry, strawberry, banana, or melon for starters? Then there are other fruits that fit the bill such as kiwi, star fruit, and orange. Fresh or frozen fruit can be used; in fact, I almost prefer frozen fruit, because I don’t have to add any ice, just water and yogurt or an immunity drink. The basic recipe is just two cups of fruit, 4 ounces of yogurt and one and one-half cups of filtered and chilled water. Blend and done! 1. Add the fruit, water, and yogurt, milk, or immunity drink into a blender, cover, and then blend until smooth. If using fresh fruit add the ice cubes with the other ingredients. 2. Serve in a tall glass with fresh fruit or mint garnish and a straw. To Serve: Pour into individual glasses and garnish with fresh fruit slices and or fresh mint springs and serve with a straw. 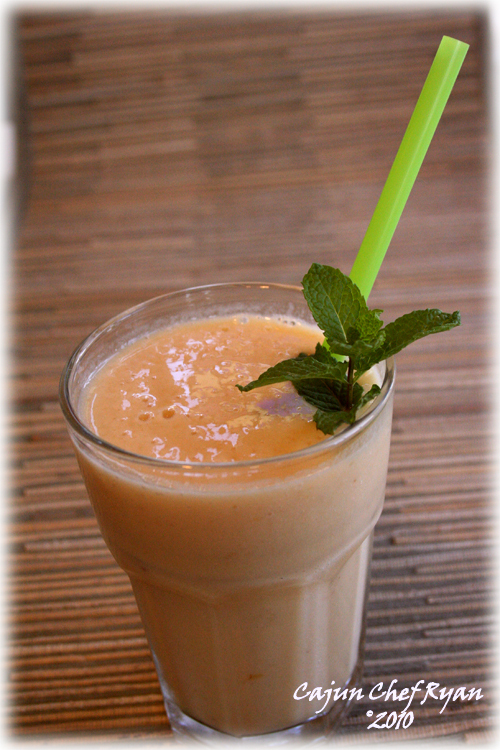 Tropical Fruit Smoothie, equal portions of pineapple, mango, banana, and peach …another view. Wow, I could go for one of those right now! It is warm for October here in New England. yep this is diffinitely a keeper yum! My hubby loves mango. I should make this for him when he is nice to me!:) . I love the combination of falvours in the smoothie. It looks awesome. It’s still pretty warm here in SoCal! 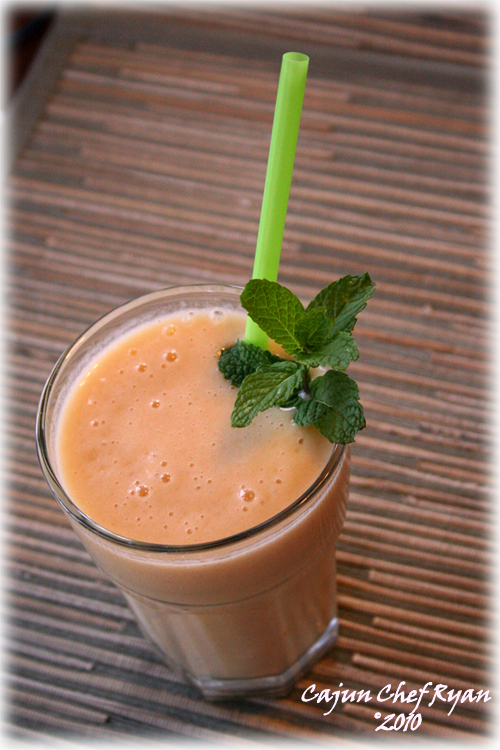 I have a smoothie for breakfast almost every morning – breakfast of champions! It looks good and refreshing. And it’s been a warm October here in Tucson as well. It has all my favorite fruits! I am going to make this tomorrow! These flavors remind me of Trinidad! (sans the peach of course.) I have a smoothie after almost every morning workout; it’s just a healthy and quick way to replenish. Great photo Ryan, love the little bubbles 🙂 Think I’ll whip me up one of these babies. Have some guava, apples, and mango, yum! I love fruit smoothies. They’re a regular in our house and a great way to get kids to have fruit. Thanks for sharing your recipe.